Another PIC microcontroller project by professor mark. 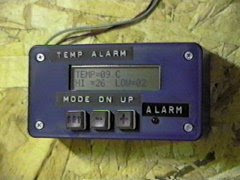 This is a simple temperature alarm which uses a PIC16C84 microcontroller and a 2-line LCD display. The alarm displays current temperature in both Celsius and Fahrenheit degrees and features a 3-key keypad which allows the user to set independent high and low termperature alarm points. The alarm also records the minimum and maximum temperatures encountered.